It was an exceptionally bearish week for US equity indexes, with net weekly declines ranging from -5.2% (SP'500, Dow, NYSE comp'), -5.1% (Nasdaq comp', Trans), to -4.5% (R2K). 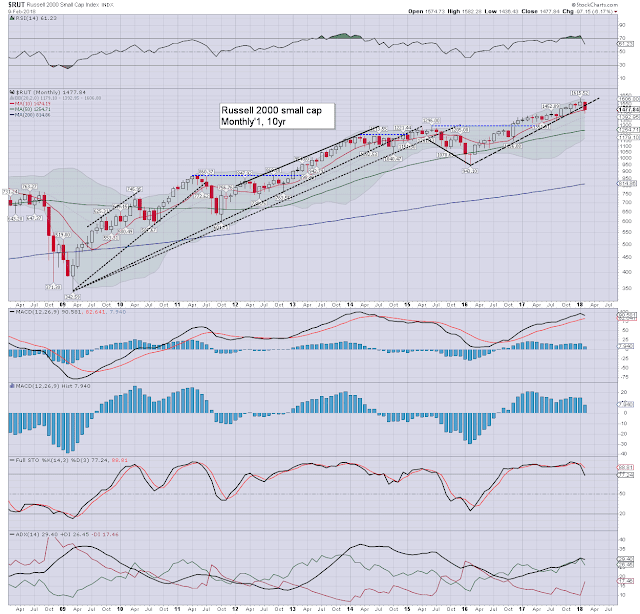 Near term outlook offers renewed broad upside, with big target of sp'2950/3047 by early summer. The sp' is currently net lower for February by -204pts (7.2%), currently at 2619. The key 10MA is at 2563, and was briefly broken under during the Friday session, for the first time since Nov'2016. Underlying MACD (blue bar histogram) cycle is ticking lower, but even at the current rate, a bearish cross is out of range until at least April. Best guess: renewed upside, with big target of 2950/3047 by the early summer. Considering recent price action (a correction of 11.8%), if the market does get stuck around 3k, the next correction could justifiably be expected to be larger, on the order of 15/20%. More broadly, the year end target of 3245 still looks rather good. Note the spike high of 1190 in July, settling moderately red. August saw a massive washout, September was choppy, whilst October saw a hyper spike floor from a marginally lower low. 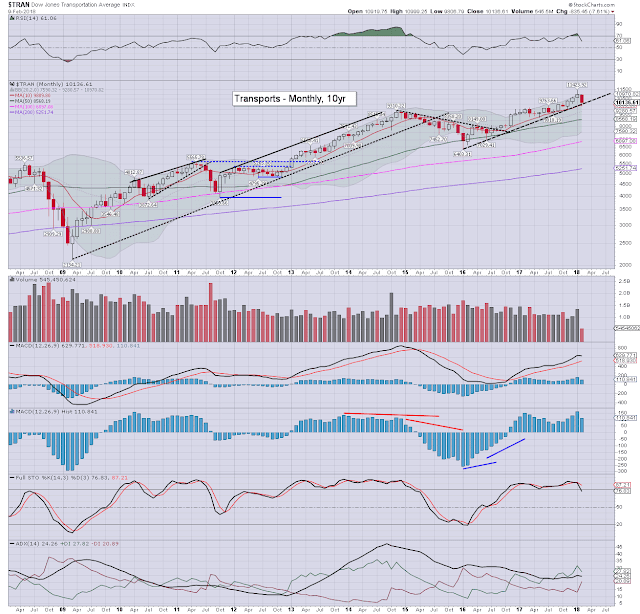 The market then resumed powerfully upward into year end. That kind of pattern is something to keep in mind, if we do get stuck <3047 later this year. The tech is currently -7.2% for February. 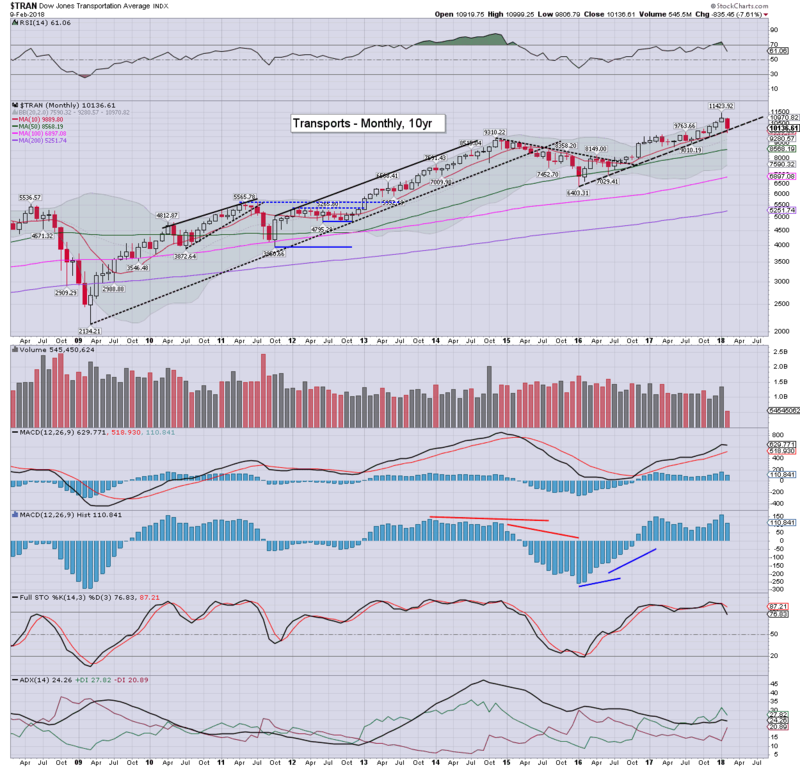 Friday saw the key 10MA fractionally broken, but we settled the week at 6874. The RSI has cooled from almost 90, back <70. 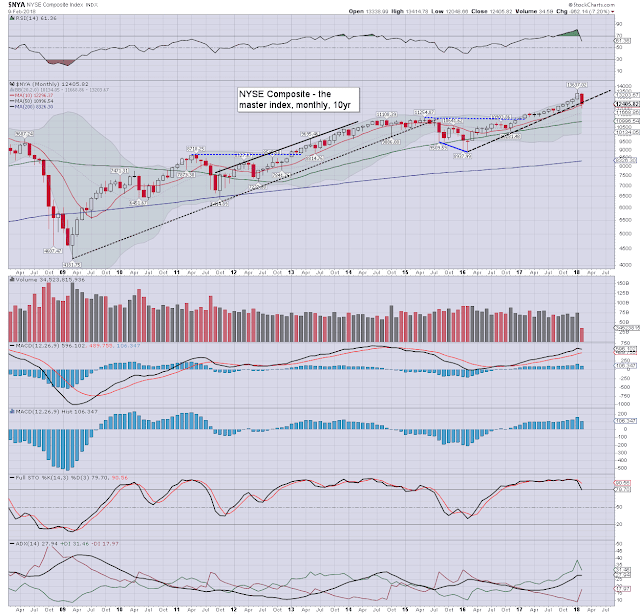 Despite the powerful swing from 7505 to 6630, the broader outlook remains unchanged. The 8000s still seem viable this spring/early summer, with 9000s for year end. 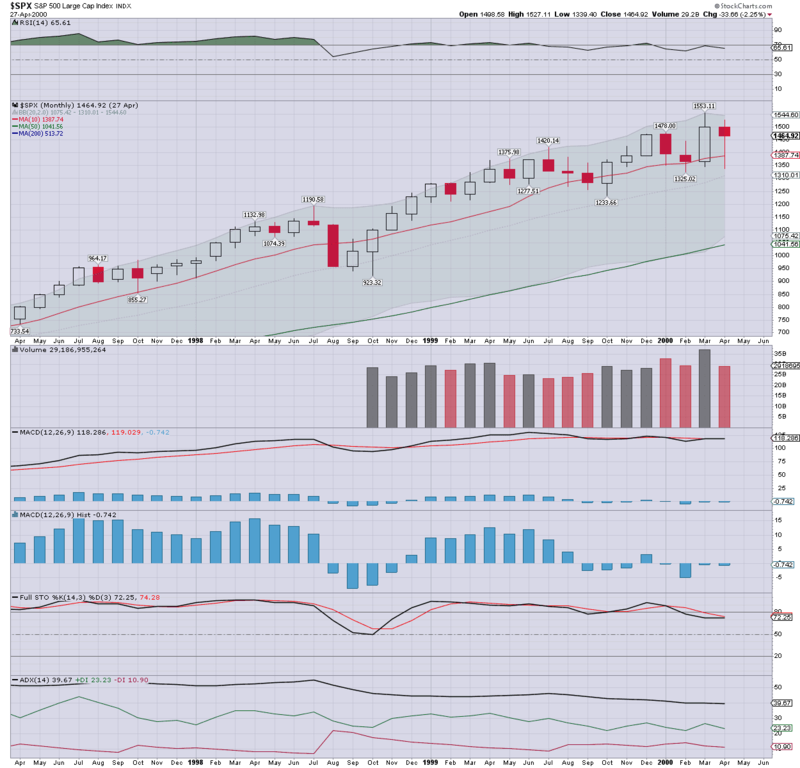 The mighty Dow is currently net lower for the month by -1958pts (7.5%) at 24190. Unlike some other indexes, the Dow hasn't tagged the key 10MA. 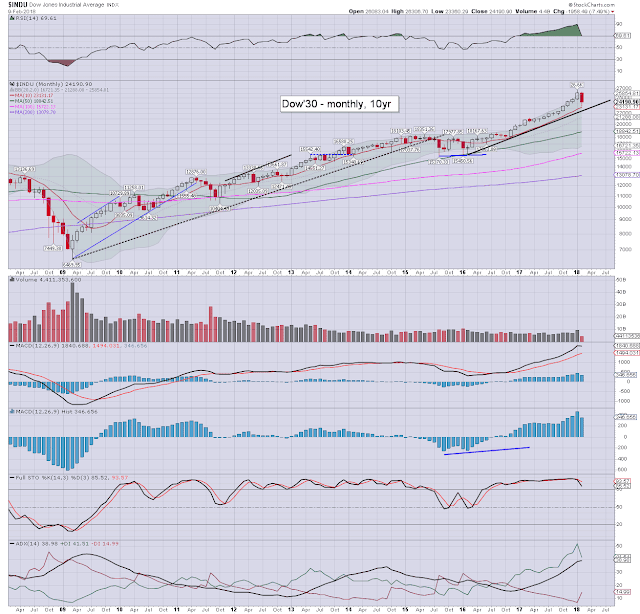 Note the upper bollinger in the 25800s. Keep in mind the key 2.6x Fibonacci extrapolation number of 26702. 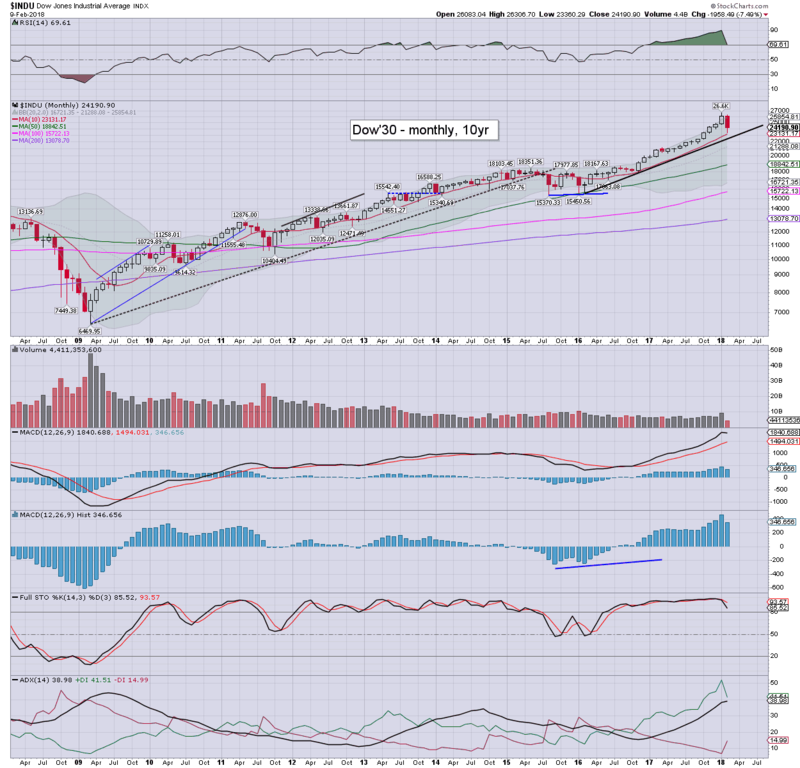 Any price action >26800s would be decisive, and offer next big target of 34/35k. Clearly, that is out of range until well into 2019. The master index is currently -7.2% at 12405. The key 10MA was tested, and we're seeing initial signs of a spike floor. 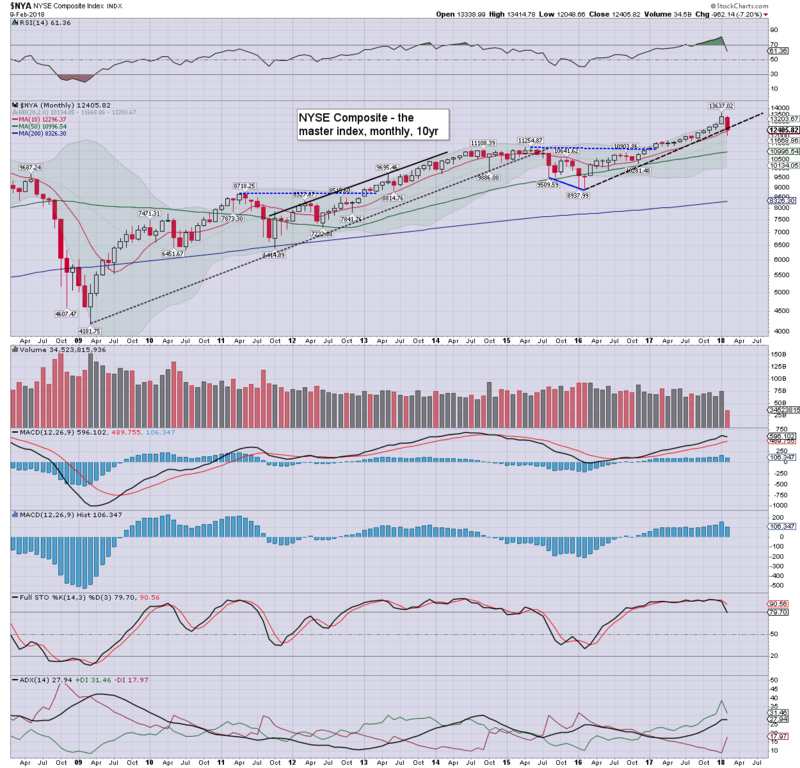 For some bullish confidence, a Feb' settlement >12900/13k would be useful. 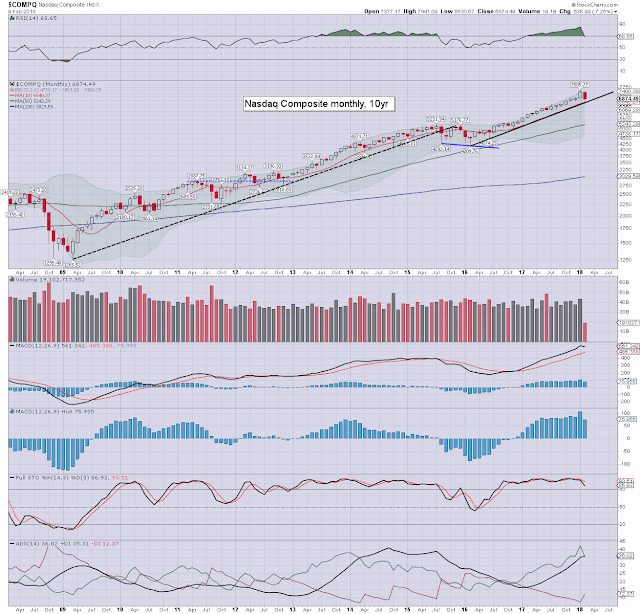 The second market leader is currently -6.2% for the month, at 1477, having spiked from 1436. Indeed, there is major price support around 1450. 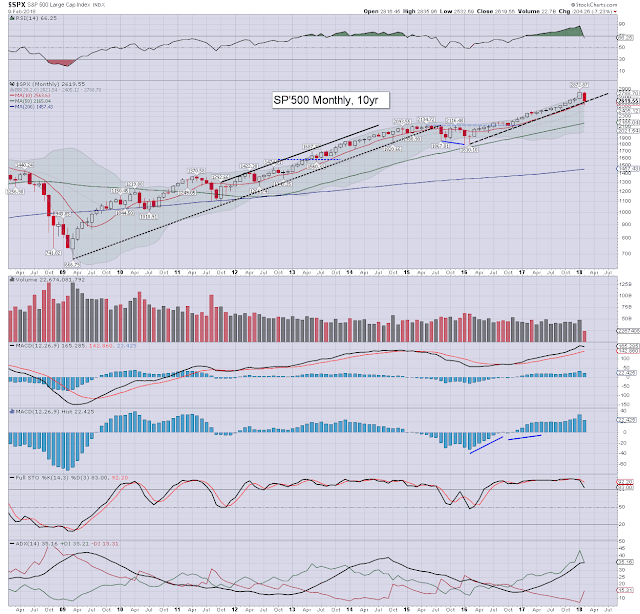 The equity bulls should be seeking a monthly close >1530/40s. 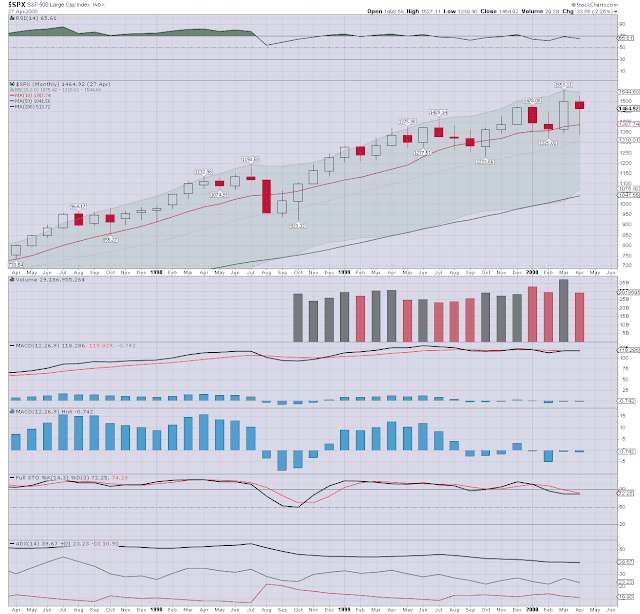 The old leader - Transports, is currently net lower for the month by a powerful -7.6% at 10136. The key 10MA was briefly traded under on Friday. 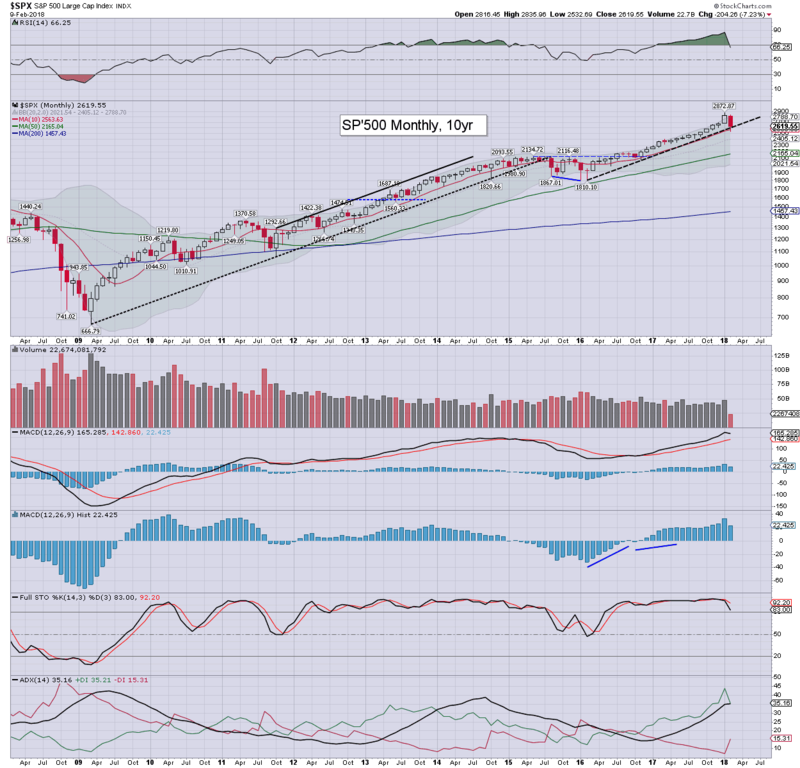 Equity bulls should be seeking a Feb' close >10600/700s. Technicals - such as RSI, have greatly cooled from multi-decade/historic highs. Equity bears still have nothing to tout unless the majority of indexes see a monthly settlement under their respective key 10MAs. 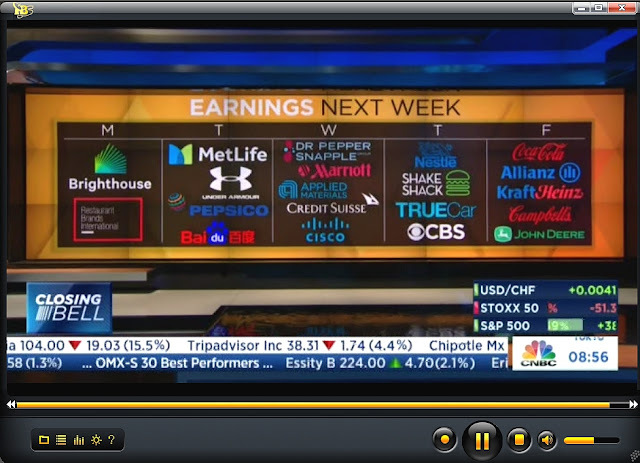 Notable earnings from AMAT, CSCO (Wed'), and DE (Fri'). T - Weekly jobs, phil' fed, PPI, empire state, indust' prod', housing market indx.